The striking Sylvester Date Palm is commonly known by many other names, including silver date palm, sugar date palm and wild date palm. This sturdy palm tree is easy to grow. It is easily the most striking large specimen palm tree that is cold hardy enough to be grown without question. The handsome Sylvester palm has a robust central trunk that is sometimes swollen at the base and lined with diamond-shaped leaf scars. The diamond patterns deepen as the tree ages. A slow-growing palm, the Sylvester can eventually reach up to 50 feet in height. The crown is full and curves attractively in an almost spherical shape. The eye-catching blue-green to silvery-green foliage is composed of many fronds that rise directly from the trunk. Each frond can be up to 10 feet in length. The 18-inch long leaflets are arranged opposite one another, creating a smooth appearance, and the leaf stems are lined with thorns. The creamy white to pale yellow flowers appear on stalks up to three feet long below the crown and are followed by clusters of fruits that are purplish-black when ripe. The dates are one-inch long ovals and contain a single seed. 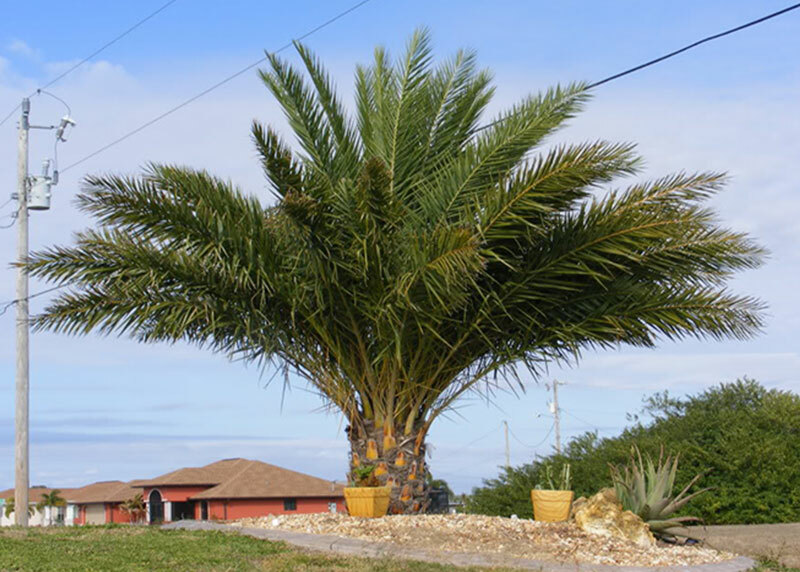 A native of India, the Sylvester is a surprisingly hardy palm, easily withstanding occasional winter temperatures as low as 15 F. Sylvester palms love the Florida sunshine. Plant them where they will get plenty of direct light and have room to grow. Some pruning may be necessary to remove old fronds, which die away and ring the trunk like a skirt.